Selecting the perfect, new guest chairs for your office doesn’t have to be a headache. Understanding which type of product will work best for your space will ensure a smooth transaction. Not all chairs were created for the same space and how durable something is can vary significantly. Understanding the entire process from start to finish will eliminate any surprises. 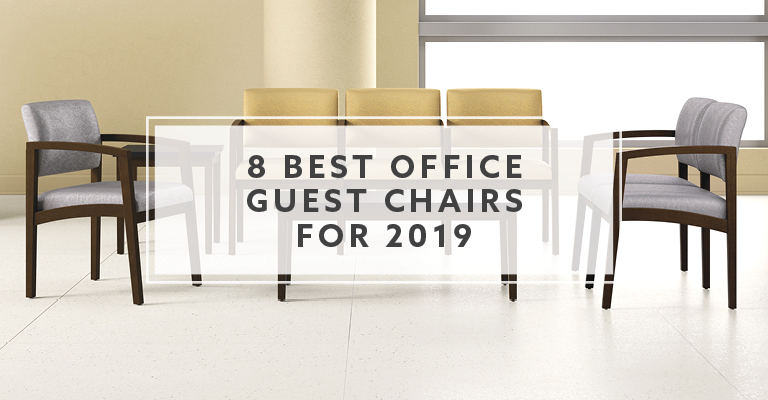 Our top eight office guest chairs for 2019 were selected based on over 13 years of experience and our company’s sales history. These are our best-performing guest chairs and they should work for most people. 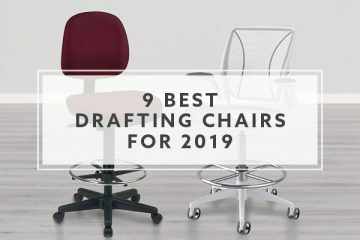 If you can’t find something that works for your space in our list, we have a wide selection of additional guest chairs on BTOD.com. What is an Office Guest Chair? 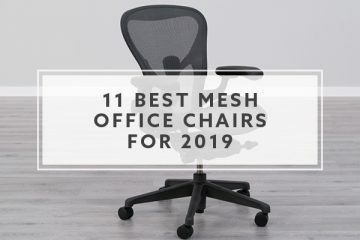 How Do We Pick the Best Office Guest Chairs? Lesro Newport Starting Price: $254.34 + Free Shipping! 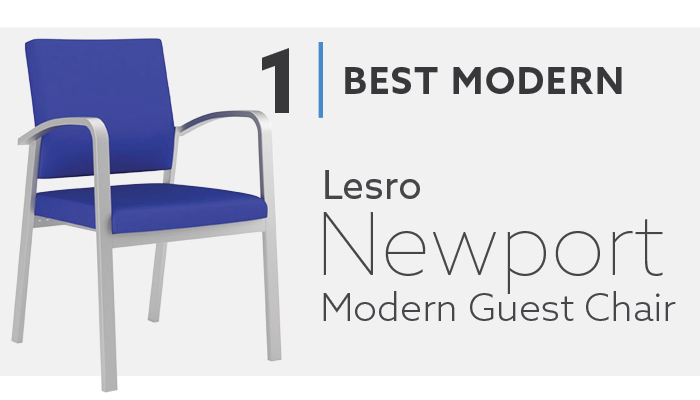 The Newport guest chair is our top pick for the best modern, office guest chair. Manufactured by Lesro, this Made in America product is solid throughout. Newport is built with a strong steel frame and comes with a standard weight capacity of 275 lbs. The durable powder coat finish is available in silver, black and white. If you’re looking for a product that can be customized, the Newport is a great option. With over 185 upholstery options, there are plenty of ways to create a unique look for your office. All upholstery options ship within ten business days. If your space requires something that is easy to clean, we highly recommend looking at the healthcare grade vinyl options for the Newport. All include anti-microbial and anti-bacterial characteristics and can be easily wiped down. While we really like the Newport guest chair, it isn’t a perfect option for everyone’s needs. At a starting price of $254.34, higher grades of upholstery can bring the cost as high as $317.34. We’re confident you get what you pay for with the Newport, but it could be outside of budgets for some. Because all Newport products are made to order, you’re not able to return them. It’s important that you consider ordering upholstery samples prior to placing your order if there is a concern the product might not work. Office Star 8505 Starting Price: $289.99 + Free Shipping! 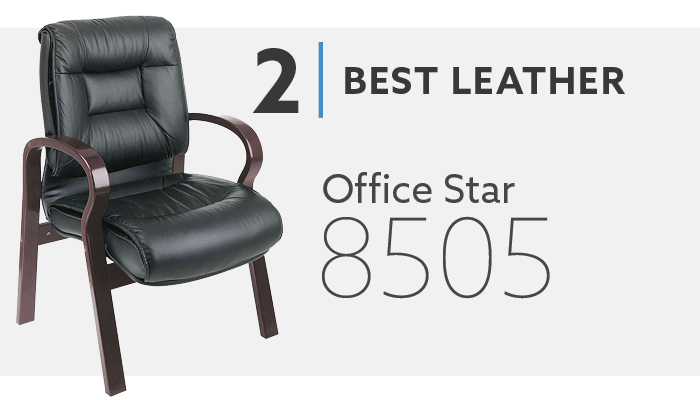 If you’re looking for a top grain leather guest chair, that doesn’t break the bank, the Office Star 8505 is a good option. Our pick for the best leather guest chair features a thick padded seat and back, with built-in lumbar support for added support. The mahogany wood finish creates an upscale look. The 8505 offers a good value under $300. The Office Star 8505 comes with a standard weight capacity of 250 lbs. Its seat width of 21.5” and depth of 22” should have no problem fitting users up to the max capacity. Weighing in at 44 lbs., the Office Star 8505 is a solid chair that should hold up well in most offices. Depending on your budget, the $289.99 price tag could be on the high side. If you’re serious about getting real leather upholstery, this is one of the most affordable options. Less expensive alternatives will offer a bonded leather upholstery, which is lower quality and tends to not hold up as well over time. While the design of the 8505’s thick padded cushions focuses on comfort and style, they aren’t great for cleaning. Specifically, the back of the seat cushion, where it meets the backrest. This area is prone to catching dust, crumbs, and hair. If you want to keep these chairs clean, we recommend running a vacuum through this space every once and awhile. Wood frame guest chairs are beautiful but tend to be less durable than metal alternatives. The arms of the Office Star 8505 are more susceptible to dents, dings and scratches than chairs like the Lesro Newport. Lesro Lenox Starting Price: $235.98 + Free Shipping! 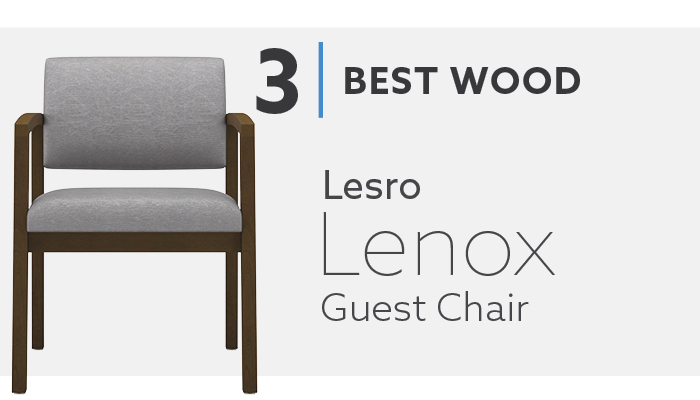 Our number one selling guest chair, the Lesro Lenox Chair, has held the top position for over three years running and is our pick for the best wood guest chair. Like the Newport, this product is manufactured in the USA and is solid throughout. Made from solid hardwood maple and harvested in the USA, it is a beautiful piece of furniture. The Lenox Guest chair is available in over 185 upholstery options and seven different wood finish colors. It also offers a standard weight capacity of 275 lbs. The Matrex mesh seat support system ensures lifelong comfort for the seat pad. This type of material has been tested for over 1,000,000 cycles and returns to its original form every time. This material is what prevents Lenox chairs from sagging over time. The Lenox guest chairs are easy to assemble, featuring an interlocking wedge system that only requires a rubber mallet for assembly. Even though the process is quick, once put together, the Lenox chair is solid and will not easily come back apart. There aren’t a lot of downsides to our number one selling the guest chair. Starting at $235.98, all the upholstery options on this chair are available for under $300. This could potentially be too expensive for some budgets. Investing in good furniture like this will mean you only have to invest once every 10 to 20years, versus every 2 to 4 years for cheaper alternatives. The wood frames are beautiful, but they are more susceptible to scratches, dents, and dings over time. If you’re looking for a more durable alternative, the steel frames on the Newport series will offer better durability over the long run. Because the Lesro Lenox is made to order they are not available for return. If you’re skeptical of the quality or colors, we highly recommend ordering upholstery and finish samples. If you’d like to see how the Lenox feels, we suggest ordering one chair to try. Lesro Newport Starting Price: $412.56 + Free Shipping! If you’re needing a wide guest chair, that can support up to 750 lbs., the Lesro Newport Bariatric chair is a good option. Our pick for the best bariatric guest chair, the Newport Bariatric chair is built with strong steel and offers a 30” wide seat. Available in matching upholstery and frame colors, the N1401G5 is our first pick and a good seating option for larger clientele. For a true bariatric chair, the starting price of $412.56 is an affordable option for anyone needing a larger chair that is built to last. If you’ve had issues in the past with bariatric guest chairs holding up, then you’re likely to see the value in chairs like the Newport that are being made in the USA. While the Lesro Newport bariatric chair is big, it’s not quite as big as a loveseat. This means that it will take up a lot of space but won’t fit two people like a loveseat might. If you have the need for bariatric chairs in your space, we highly recommend adding them. If you’re looking for a heavy-duty loveseat, this isn’t a good option. 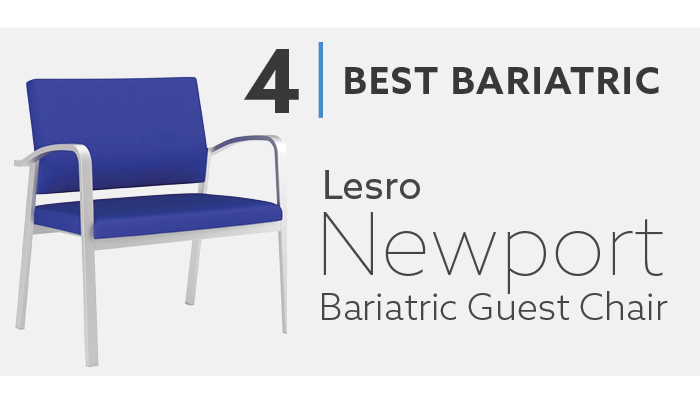 Like the other Lesro products on our list, the Newport Bariatric is made to order and cannot be returned. If color match is important, we highly recommend ordering upholstery swatches before placing an order. Because of the size of this product, it is a heavy piece of furniture. At 54 lbs., it is the heaviest option in our list. This should be a good thing if you’re looking for a chair to properly support up to 750 lbs. of weight. Moving the Lesro Newport bariatric could be difficult with one person and may require two people. OTG 11770B Starting Price: $173.99 + Free Shipping! If you’re looking to make a big first impression in your executive office, but don’t want to break the bank, the OTG 11770B is it. Our best executive office guest chair features a cordovan wood finish on the arms and legs, with a soft black luxhide upholstery on the seat and backrest. The 11770B is affordable and available for only $173.99 per chair. With an overall dimension of 26” deep and 24” wide, the Offices To Go guest chair has a small footprint to fit most executive offices. The standard 250 lbs. capacity should be enough to support most visitors who stop for shorter periods of time. If you’re looking for a real leather experience, this chair is not a good option. The black luxhide upholstery offers a nice supple feel but is made from a bonded leather material. 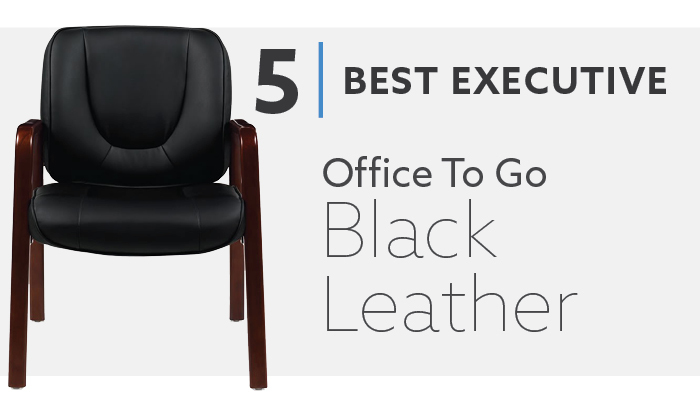 This material won’t hold up as well in high traffic areas as the Office Star 8505 leather guest chair featured in this list. Dakota Starting Price: $145.00 + Free Shipping! With space at a premium, guest chairs that provide the ability to stack are becoming increasingly popular. 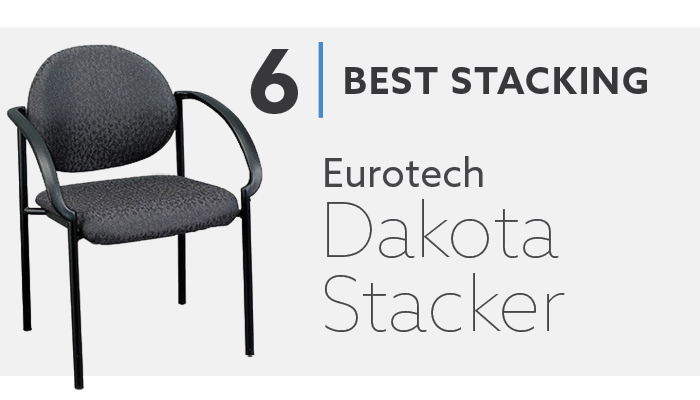 The Eurotech Dakota chair is our pick for best stacking guest chair. Available for less than $145 per chair, the Dakota can stack up to four high and is built to hold up to high traffic environments. With four standard upholstery options and one frame finish, there is some customization available to the quick ship Dakota stacker. For an added upcharge, the Dakota can be upholstered in hundreds of different colors and fabric types. The custom, upholstered Fabrix version of the Dakota extends the lead time up to 10 business days. The Dakota stacker is a good value and does provide the ability to stack your guest chairs. Unfortunately, one of the downfalls with most guest chairs that stack is they only offer minimal stacking quantities. The Dakota can only stack up to four chairs high. Like the Lesro products, the Dakota is available in a custom upholstery program. This gives users access to a lot of additional color options but makes the chair non-returnable. For those considering this program, we recommend ordering color swatches to ensure the colors are correct. STC3440 Starting Price: $140.99 + Free Shipping! 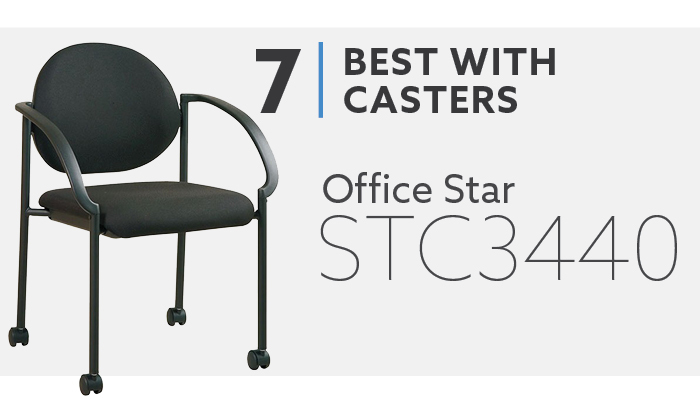 Our best pick for guest chairs with casters is the Office Star STC3440 chair. Featuring dual wheel carpet casters and the ability to stack up to four high, the STC3400 provides good flexibility for any office setup. Once stacked, you can use the chair’s casters to move the four chairs around easily. The STC3440 comes standard with a black powder coated frame and is available in up to 40 different upholstery options. Even with that many upholstery options, the STC3440 still ships within 5-7 business days. This provides some customization should if needed. With a max seat width of 19”, the STC3440 won’t fit large individuals comfortably. Even with a load capacity of 250 lbs., the STC3440 is better suited for those that are under 220 lbs. One of the biggest downsides to guest chairs with casters is the inability to keep your space looking well kept. When visitors can easily move chairs, you’ll likely find yourself spending time moving them back. If you need the mobility of casters, there isn’t a more efficient way to move them than using four dual wheel casters. SD-2052A Starting Price: $85.99 + Free Shipping! 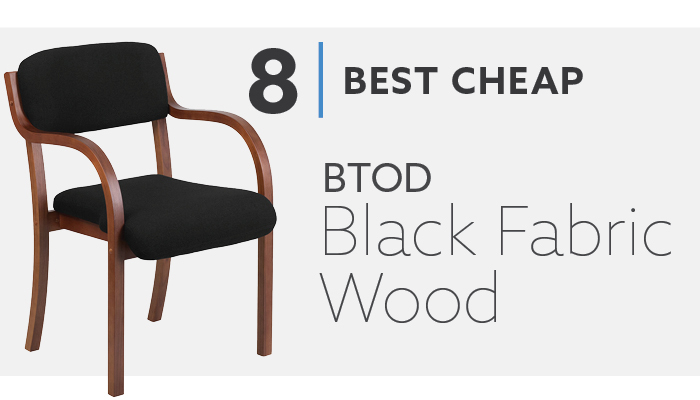 The BTOD SD-2052A is our cheap guest chair pick for 2019 and at $85.99, it is hard to find a better bargain. 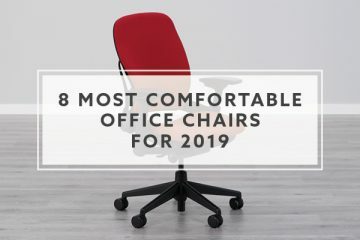 It’s important to set your expectations in the right place as this chair won’t be in the same class as similar looking products from brands like Lesro. For the money, it is a good chair for low to medium traffic spaces. The SD-2052A is available in three solid hardwood finishes including Walnut, Mahogany and Beech. It comes with a standard black upholstery and is rated for 250 lbs. If you’re looking for a small footprint, the SD-2052A is 21” wide and 23” deep, which is the smallest in the list. Considering it’s available for under $90, it is the cheap pick for a reason. Coming in at a weight of only 14 lbs., the SD-2052A doesn’t have a lot of mass behind it. This can be an issue when trying to keep chairs in one place. Being this small and lightweight can feel a bit uneasy for heavier individuals, so that is something to consider depending on how they will be used every day. While there are three wood finish options, there is only one upholstery option. Available in a standard black fabric, there isn’t a long list of customizations like some of the more expensive alternatives in the list. If you’re looking to create something more custom, this isn’t a good fit. An office guest chair is any chair that is suitable for guests to sit at when visiting your office. They come in all different shapes, sizes and material types. Depending on your specific needs, you could require large guest chairs if your visitors are heavier than normal. If space is limited, guest chairs with wheels will provide more flexibility for your small space. How Do We Pick the Best Office Guest Chair? We have been selling office guest chairs for over thirteen years. With that experience, we have seen plenty of products succeed and fail in the field. While the saying, “you get what you pay for” is true, there are still good values out there. Having the right expectations for a certain brand or series can make your ownership a better experience. It’s hard to believe, but furniture emergencies exist, and it is something we deal with on a regular basis. Whether you’ve been planning an office remodel, new construction, or just decided you want to update the office, providing plenty of lead time for furniture will make your life less stressful. Unfortunately, a lot of customers wait until the last minute to place their furniture orders. This puts them in a bad position for product selection and creates the potential for an opening without new furniture. Ask your vendor how long, worst case scenario, that your new furniture will require to ship and be received. Are you looking at standard upholsteries that are sitting on a shelf or something that is made to order? Both options will have distinctly different lead times. For most of the brands that we carry, four weeks is plenty of time from when you order to receive your new guest chairs. If color match is important to your space, you absolutely must get fabric and finish samples prior to placing an order. What you see on your monitor and how the actual colors will look in your space can vary significantly. Without putting the swatches in your space, you have no idea how lighting will affect the colors. If you order multiple pieces or something that is made to order, returns can be expensive or not possible at all. Receiving samples prior to placing an order can save the headache and expense of returns or reorders. If you’re unsure of a chair’s quality or comfort, consider getting a single chair order to test. This can take a bit longer but will save you in the end if you don’t like the chair. Measure your space, then measure again. Understanding what will fit in your space is crucial to your office’s success. If you’re ordering for a new lobby, maximizing your seating is important, but you don’t want to make it uncomfortable for guests. Finding the right mix of seating, with and without arms, larger chairs and tables for spacing can create a comfortable waiting area for guests. Start with measuring your space, then looking at the overall dimensions of the chairs. Consider how you’d like to see people moving through your space from the front entrance, to the lobby desk, and other areas within your space. If you’re placing guest chairs at a desk, provide enough room for guests to get in and out of the chairs comfortably. How durable upholstery is can make or break the life cycle of your chairs. Do you have a high traffic lobby? If so, you’ll want to look at upholsteries that are a minimum 100,000 double rub rating. Double rubs are essentially the equivalent of getting in and out of a chair. Each time is a double rub. Upholstery durability isn’t based on grading, but actual double rub counts. Commercial grade upholstery has a minimum of 25,000 double rubs, but the number can go well into the millions. keep in mind with office guest chairs is that most will tend to be on the firm side. This is done intentionally, as firmed seat cushions tend to hold up better over time. If you’re looking for something with deep cushions, it’s important to ask the vendor before purchasing how soft the seat and backrest are. Before you place an order for new guest chairs, you must consider how they will be shipped. If you only order a couple of chairs, there is a good chance they will be able to ship via a common carrier like UPS or FedEx. If your chairs ship fully assembled, are large lounge chairs or consist of four or more pieces, you could be receiving a freight shipment. A freight shipment is done on a semi-truck, with a 53’ long trailer and the product is almost always palletized. Receiving your shipment via semi has its pros and cons but will be a different experience than via Fedex. If your chairs ship via Fedex or UPS, you can expect a similar experience to this type of shipment you normally receive. They will bring the items to your door or into the threshold of your office suite. You will most likely receive tracking prior to shipment and will have an estimated day for delivery. You cannot make delivery appointments with this type of shipment. Receiving a truck shipment, the default way for delivery is via loading dock or back of the truck if you don’t have a proper loading dock. At BTOD.com, we include a freight shipment delivery appointment for all orders. This will provide a 2-3 hour window for when the items can be expected for delivery. This window of time is generally set up 24 hours in advance but isn’t always guaranteed with the amount of advance warning. If you have a loading dock, they will roll the items off the truck and into your receiving area. If you don’t have a dock, the driver will roll the items to the back of the truck and it’s the customer’s responsibility to pull the furniture down. If items are banded to a pallet, the driver will cut the banding and help you take the items off the pallet. Most freight carriers will require you to dispose of the pallet or charge you to keep it on the truck. Additional services are available for most shipments at an extra cost. These include a lift gate which helps to lower the pallet to the ground. From there it is the customer’s responsibility to move the items into the building. Standard inside delivery is available, but when done via freight company the services are basic. The building must have front doors large enough for the driver to roll the pallet into the front lobby. The carrier will not take the items up steps or beyond the threshold of the front door. If you’d like these services to be performed, it requires a specialty carrier and a separate quote. This type of delivery can extend lead times 2-6 weeks and can be expensive, depending on the location and request. These types of services can also include assembly options, should you not want to assemble the furniture yourselves. The last thing to consider is the assembly of the furniture. While some items like lounge chairs and sofas arrive assembled, more wood and metal frame chairs will arrive knocked down. This means that assembly is required. Having items ship this way keeps the cost down significantly, since shipping fully assembled items are bulky and very expensive. Not all guest chairs require a significant amount of assembly or level 12 handy person status. Brands, like Lesro, have perfected the interlocking wedge assembly system which eliminates the need for tools, except for a rubber mallet. Understanding what’s required of you prior to shipment, will make your experience better. Asking your vendor for assembly instructions or videos will give you a better idea if you’re up to the task of assembly. As mentioned in the previous section, we have access to specialty companies that can perform an assembly for you. This can either be done on-site or at a separate location and brought to your space fully assembled. This service comes at a cost and can delay shipments significantly. Alternatively, looking on websites like Thumbtack and Yelp, you are likely to find smaller, local companies that can perform this for less money. Finding the perfect office guest chairs for your space doesn’t have to be a daunting task. Following our seven things you must consider will help to avoid most headaches customers typically experience. Once you’re able to focus on chairs that fit your budget, space and timeline, you will be on your way to making a solid investment for your future.